The Edinburgh Fun Casino Co. – Sponsors of Mobile Casinos Edinburgh. GB Fun Casinos provide a professional casino experience including casino table hire and experienced croupiers. Simply plan your Wedding, invite your guests and prepare to enjoy an evening of entertainment without the risk of losing any real money. We offer a professional and friendly casino service for a range of events such as weddings, corporate events, birthdays, charity fundraisers and more. With a wide range of casino games on offer and some amazing prop’s to theme your venue we can help make that special day unforgettable. 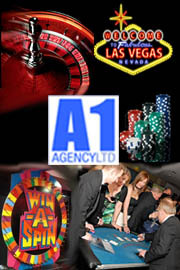 A1 Agency Ltd – Putting the fun in fun casino! Enjoy real casino tables with qualified croupiers who will ensure your wedding goes off without a hitch. With a variety of casino games such as Blackjack, Roulette, Craps, Wheel of Fortune and Stud Poker we are sure you will find something to really dazzle your guests. A Nevada Nights Fun Casino is always a winning event!